Wills after 1858 are available in an index. The National Archives are bringing wills prior to 1858 on-line. Wills can be proven many years after they were written or the person died. These can be long searches. Her Majesty's Courts Service gives a load of information on wills including a form to download and send in with payment to obtain a copy of the will (if there is one) as mentioned above it costs £5. This will is from 1990 so no beneficiary names are listed to protect privacy. Keep checking The National Archives as these are coming on-line. 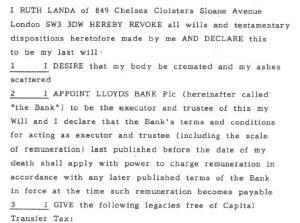 There is a cost of £3 to download a will once you have found it. PCC (Prerogative Court of Canterbury) wills are available online (pay to download) covering the period from 1384 to 1858. Prior to 1882 wills were not made by married women. They had no possessions or assets of their own, in legal terms. Everything they had belonged to their husbands. Widows did leave wills, though, if sufficiently wealthy. Principal Probate Registry, First Avenue House, 42-49 High Holborn, London WC1V 6NP Email them initially, but a personal visit is required.